Mia Laity began playing violin at age three and made her solo debut at age eleven, performing with the Baylor University Orchestra. In 2007 and 2009, she appeared with the Phoenix Symphony, first as the Grand Prize winner of the Phoenix Youth Symphony Concerto Competition, and then again as the 1st Place and Clotilde Otranto prizewinner. Ms. Laity has performed as soloist with the Four Seasons Orchestra, the Phoenix Youth Symphony, the Luzerne Summer Music Center Orchestra, and the Lamont School of Music Summer Academy Orchestra. In 2009 she performed with the Colburn Honors Quartet on the Sundays Live! radio broadcast recorded at the Los Angeles County Museum of Art. An alumna of From the Top and the New York String Orchestra Seminar, Ms. Laity was also recently named a finalist in the prestigious 2010 Blount-Slawson Competition and Grand Prize winner in the National Debut Competition. 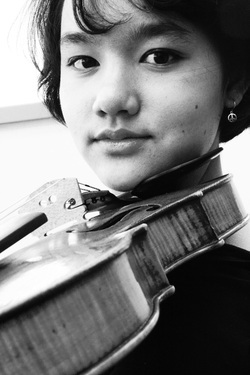 She will perform as soloist with the Debut Orchestra in their 2010-2011 season. In Los Angeles, she is Assistant Concertmaster of the Debut Orchestra and is in her second year in the Colburn Honors Quartet Program. A former student of Arkady Fomin, Borivoj Martinic-Jercic, and Nokuthula Ngwenyama, she currently studies with Danielle Belen at the Colburn School of Performing Arts.